.. relating ZIP codes to cities .. 214 ZIP code areas intersect with New York city — what are these ZIP codes, their population and how many are completely within the city? What part of a ZIP code area of interest intersects with what city? Conversely, what ZIP code areas intersect with a city of interest? This section provides data and tools that can be used to answer these types of questions and gain insights into geospatial relationships. See more detailed information in the related full Web section. The 2010 ZIP Code Tabulation Area (ZCTA) to City/Place relationship data provide a means to equivalence ZCTAs with Census 2010 cities/places. ZCTAs are geographic areas defined as sets of Census 2010 census blocks closely resembling USPS ZIP codes (lines, not areas). ZCTA boundaries are fixed for the intercensal period 2010 through 2020. Census 2010 vintage city/place areas are likewise defined as sets of Census 2010 census blocks. The ZCTA-City/place relationship data are developed through the use of the intersecting census block geography and associated Census 2010 Summary File 1 demographic data. The following graphic shows relationships between two selected ZCTAs (red boundaries) and related cities/places (blue fill pattern) in the Pima/Cochise County, AZ area. Relationships between these geographies are reviewed in examples shown below. Two examples illustrating how to use the ZCTA-place relationship data are provided below. The examples are interconnected to the GIS project used to develop the map views, interactive table and data file described in this section. 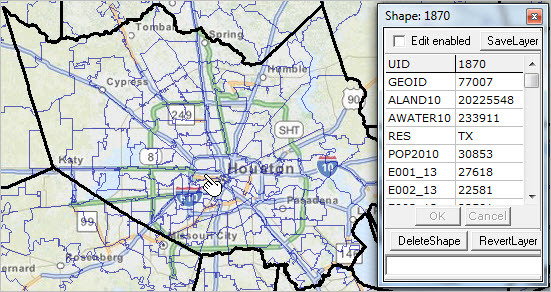 Example 1 describes how to use the data for a ZIP code area entirely located within one city/place. Example 2 describes how to use the data for a ZIP code area located in more than one city/place and area not located in any city/place. In this example, ZCTA 85711, highlighted in red in the graphic shown below, falls wholly within place 77000, outlined in bold black below. As a result, there is only one corresponding record for ZCTA 85711 in the relationship file. The 2010 Census population for this relationship record is 41,251 (POPPT) which is equal to the 2010 Census population for ZCTA 85711 (ZPOP). See more details about this example. In this example, ZCTA 85630, highlighted below in red in the graphic shown below, contains two places: all of place 62280 and part of place 05770, both are outlined in black below. As a result, there are two corresponding relationship records in the relationship file. For the first relationship record, the total 2010 Census population for ZCTA is 2,819 (ZPOP). See more details about this example. Use the full interactive table to examine U.S. national scope ZCTA-city/place relationships. The following graphic illustrates how ZIP code can be displayed/examined for one city — Tucson, AZ. Each row summarizes characteristics of a ZIP code in Tucson. The last row in the graphic shows characteristics of ZIP code 85711 — the same ZIP code reviewed in Example 1 above. Click graphic for larger view. .. there are 26 ZIP codes in the U.S. that have a median housing value in excess of $950 thousand .. find out about the demographics for your ZIP codes of interest .. view ZIP code areas and demographics in context of other geography. Create custom thematic pattern ZIP code area maps for any area in the U.S. using tools and data described in this section. Use the no fee CV XE GIS software with the associated no fee ZIP Code demographics GIS project and datasets to develop maps for areas of interest. This section provides an overview. See related Web section for step-by-step instructions to get started. These tools and data are not demos. The software and datasets are accompanied by an interactive table in this section. Use the interactive table to view, compare, contrast, rank or query ZIP code areas and associated demographic-economic characteristics. More about ZIP Code areas and data resources. View developed with CV XE GIS software. Click graphic for larger view. Where are ZIP code areas that meet a certain criteria? The next graphic illustrates use of the tools to develop a 48-state zoom-out view showing ZIP code areas with two selected income intervals. Use the interactive table in related Web section to view ZIP code characteristics in an interactive tabular format. The following graphic illustrates use of the table to rank ZIP codes in descending order on median housing value (rightmost column). Housing value estimates are top-coded at $1,000,001. Join me in a Data Analytics Lab session. There is no fee. Discuss how tools and methods reviewed in this section can be applied to your situation. — Warren Glimpse is former senior Census Bureau statistician responsible for innovative data access and use operations. He is also the former associate director of the U.S. Office of Federal Statistical Policy and Standards for data access and use. He has more than 20 years of experience in the private sector developing data resources and tools for integration and analysis of geographic, demographic, economic and business data. Single year of age (SYOA) demographics are demographic data summarized for the single year of age population (e.g., age 1, age 2, etc.) for a geographic area such as a county, census tract or ZIP code area. This section is part one of three sections and is focused on tools and methods to access, integrate and analyze SYOA data. The second part is focused on integrating these data with other data and use of GIS and geospatial analysis. The third part reviews how these data are used to develop projections and access to/use of projections. See more details in related Web section. – Click graphic for larger view, zoom-in, labeled with ZIP codes and rate. – View developed with CV XE GIS. Except for possibly the single year of age 0, less than one year of age, single year of age demographics are intrinsically not in high demand. The fact that the single year of age demographics can be aggregated to standardized age cohorts and custom age groups is another matter entirely. Analysts and researchers often need current estimates or projections for age-gender-race/origin groups that are not available from pre-planned tabulations. Uses of these SYOA data include the basics of understanding the size of a specific age group relative to the total population. Or, how the size of a total population age group compares among genders or a specific race/origin. There are a myriad of more focused applications such as estimating voter propensities/outcomes for certain combinations of age by gender by race/origin combinations. What single year of age data are available and how can they be used to meet these needs? The only Census Bureau-sourced option for SYOA county or sub-county geography data from Census 2010 forward is Census 2010. Age-related data from the American Community Survey (ACS) exist only for age groups (other than a few selected single year tabulations). Age-related data from the Census Bureau model-based annual estimates (county-up) are only available at the 5-year age cohort level. Most SYOA data (covering each age to age 99 and 100 and over) are further broken out only by gender and race/origin. That is, there are no SYOA summary data for other attributes such as foreign born for each/all ages. Census 2010 and ACS Public Use Microdata Sample data can be used to tabulate/estimate SYOA data with extended attributes though 1) such estimates can only be developed for areas 100,000 population or more and 2) the thinness of number of cases generally makes this infeasible. The National Center for Health Statistics (NCHS/NVSS) provides SYOA data for county geography. These data are controlled to Census Bureau annual model-based estimates (not released by Census). The NCHS “bridge estimates” data are available annually 2010 forward (2013 estimates available as of March 2015). See more information. ProximityOne provides census tract, ZIP code area and county-up geography SYOA estimates and projections to 2020. See more information about 5-year projections and projections to 2060. The Census-sourced single year of age demographics for sub-county areas are from the Census 2010 Summary File 1 (SF1). The Census 2010 SF1 “PCT012” (PCT: Population Census Tract and higher geography) tables provide single year of age by gender by race/origin population data for U.S. national scope census tract, ZIP code area and higher level geography. See more about the content and structure of the PCT012 tables. 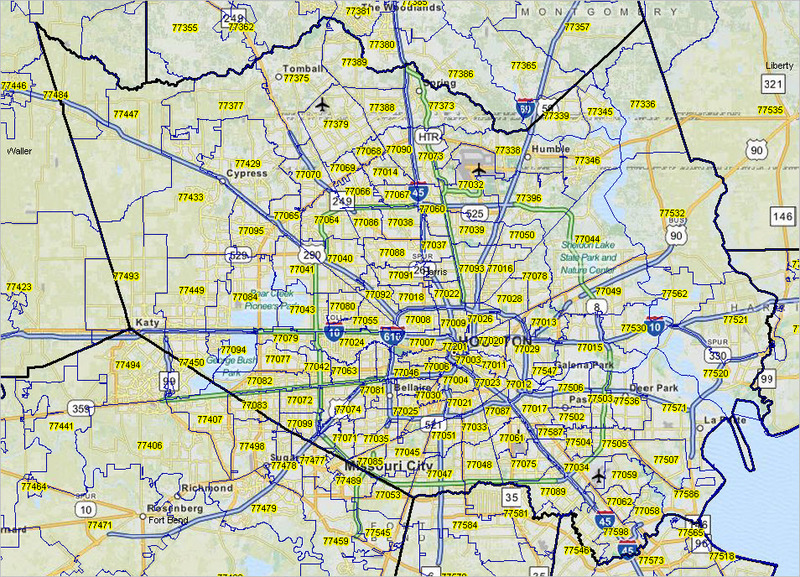 SYOA-based profiles based on the PCT012 data for ZIP Code area 77077 (Houston, TX) are shown below. The tables have been developed using the ProximityOne Modeler2 software (more below). Click graphic to view full scroll section. The Modeler2 software has been developed by ProximityOne to create demographic-economic estimates and projections at the sub-county geographic levels including census tracts and ZIP code areas. Annual estimates and projections are developed for 2010 through 2020 by single year of age, and for age groups, by census tract and ZIP code area. The Modeler2 software can also be used to develop Census 2010-based SYOA profiles such as those shown above. While the Census 2010 PCT012 tables provide the basic data needed to develop these profiles, there is a lot that lies between the data existing and the development/availability of consumable data. As shown in the description of the PCT012 tables, the data are organized in Census 2010 SF1 as a set of tables that need to be separately accessed … and then transformed to a usable format. The Modeler2 software provides two options to access and use the basic PCT012 data: via a locally stored all U.S. dataset or via the Census API (a feature integrated into the Modeler2 software). Members of the ProximityOne User Group can download and use Modeler2 Level 1 and create SYOA profiles for any county in the U.S. See the User Group section for more information about installation and use. 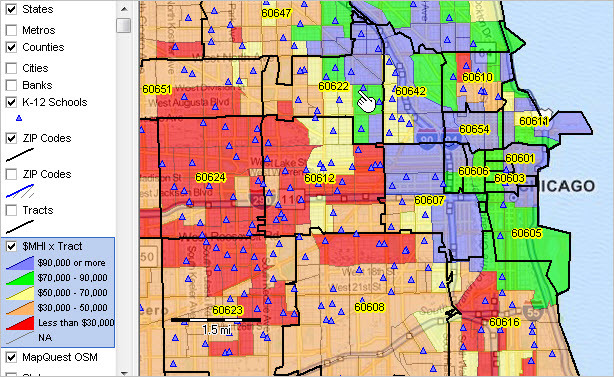 .. what are the options to access and use ZIP Code area geographic, demographic and economic data? 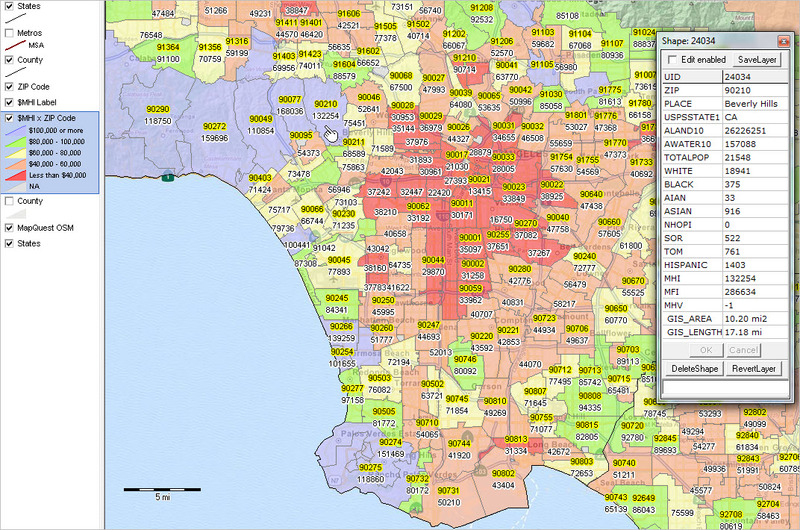 This section provides an overview of selected options available to access ZIP code area data from Census 2010, American Community Survey and 5-year current estimates and projections. A ZIP Code Area (ZCA) is a set of generally contiguous of Census 2010 census blocks that approximates the corresponding U.S. Postal Service (USPS) ZIP code delivery area. The USPS does not define ZIP code delivery areas as polygons; rather they are a collection of lines/streets and roads. 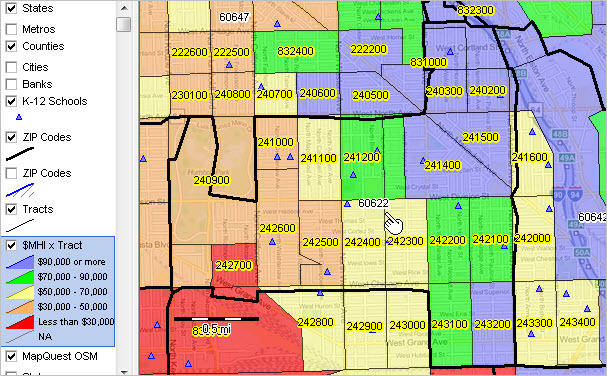 See the related section about ZIP Code area data access options. See corresponding Web page for more details on topics covered here. American Community Survey 2014 estimates to be released in December 2015. Data for ZIP code areas (ZCAs) described below are for ZIP code areas defined as of Census 2010. In general, the boundaries have not been changed since that time. In contrast, some USPS ZIP codes have been added/modified since Census 2010. Census 2010 ZCAs do not cover the U.S.wall-to-wall as the result of some geographies not being populated. However, in most urbanized areas Census 2010 ZIP code areas closely approximate USPS ZIP code delivery areas as of 2010. The USPS does not provide boundaries for USPS ZIP code areas. There are approximately 33,120 Census 2010 ZIP Code areas. 1.1. Equivalence Files. ZCA component census blocks may be determined by using the Census 2010 Summary File 12010SF1 geographic header record. Block level records in that file contain both the block geocode and the ZCA code. 1.2. Shapefiles: Mapping ZIP Code Areas. Create ZCA reference and/or thematic pattern maps using the CV XE GISand ZCA shapefiles. Members of the ProximityOne User Group may use the GeoGateway feature to download ZCA boundary files and add the ZCA boundary shapefile as a layer in a GIS project. The graphic below shows Texas ZIP Code areas (dark blue boundary) with a zoom-in to Harris County (bold black boundary)/Houston area. The view was created from scratch in minutes using the CV XE GIS GeoGateway tool. Click graphic for larger view showing ZIP codes as labels. View developed with CV XE GIS. Census 2010 demographics are available for ZIP code areas. There are no “richer demographics” (such as educational attainment, income, employment, language spoken, enrollment, housing value etc.) available for any type of tabulation area — owing to the fact that those questions were not on the questionnaire. 2.1. Demographic Profile Summary File. A recommended collection of Census 2010 data for ZIP code areas is available from the “Demographic Profile Summary File.” See more about theDPSF structure and content. See corresponding Web page to acquire this dataset. 2.2. Census 2010 More Detailed Subject Matter. More detailed Census 2010 ZCA data are available from the Census 2010 Summary File 1 and the Census 2010 Summary File 2. The more detailed Census 2010 data may be viewed/downloaded using the Census Bureau FactFinder or Census API or using custom extracts developed by ProximityOne. 2011 American Community Survey 5-year demographic-economic estimates (ACS0711) for Census 2010 ZCAs were released in December 2012. These estimates are centric to mid 2009. 3.2. Augmented 2011 ACS Interactive Tables. Extract ZCA data from 2011 ACS interactive tables to Excel. The only difference between the above sets of Web sections is the data extraction feature. 3.3. 2011 ACS Demographic-Economic Profile Datasets. The same subject matter data shown in the interactive tables area available in the form of datasets. There are four datasets corresponding to the content and data organization shown in the tables. See corresponding Web page to acquire these datasets. 3.4. 2011 ACS More Detailed Subject Matter. 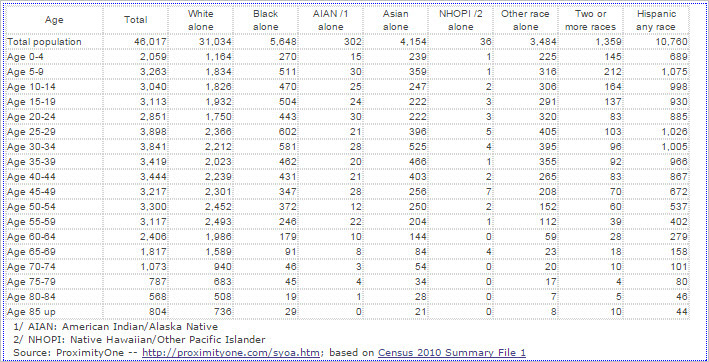 More detailed 2011 ACS data may be viewed/downloaded using the Census Bureau FactFinder or Census API or custom extracts developed by ProximityOne. 2012 American Community Survey 5-year demographic-economic estimates (ACS0812) for Census 2010 ZCAs were released in December 2013. These estimates are centric to mid 2010. 4.2. 2012 ACS Demographic-Economic Profile Datasets. The same subject matter data shown in the interactive tables area available in the form of datasets. There are four datasets corresponding to the content and organization shown in the tables. See corresponding Web page to acquire these datasets. 4.3. 2012 ACS More Detailed Subject Matter. More detailed 2012 ACS data may be viewed/downloaded using the Census Bureau FactFinder or Census API or custom extracts developed by ProximityOne. 2013 American Community Survey 5-year demographic-economic estimates (ACS0913) for Census 2010 ZCAs were released in December 2014. These estimates are centric to mid 2011. 5.1. 2013 ACS Demographic-Economic Profile Datasets. The same subject matter data shown in the interactive tables area available in the form of datasets. There are four datasets corresponding to the content and organization shown in the above ACS 2012 tables. See corresponding Web page to acquire these datasets. 5.2. 2013 ACS More Detailed Subject Matter. More detailsd 2013 ACS data may be viewed/downloaded using the Census Bureau FactFinder or Census API or custom extracts developed by ProximityOne. ProximityOne develops annually updated demographic-economic estimates and projections for ZIP Code areas. See more about the ZIP Code 5-Year Annual Estimates & Projections. .. analyzing census tract demographics by ZIP code … a wide range of demographic-economic data for census tracts and ZIP code areas are now developed annually as a part of the American Community Survey (ACS). Census tract and ZIP code area demographics are popular for examining characteristics of sub-county areas. This section reviews use of resources to analyze census tract demographics in context of ZIP code areas. For many analytical and decision-making applications these methods might be preferred to analyzing ZIP code area demographics alone. See related Web section for more detail on topics covered here. Census tracts provide a more granular geography than ZIP code areas, have well known boundaries, have little change over the decade and provide a more uniform population size, averaging 4,000 population. 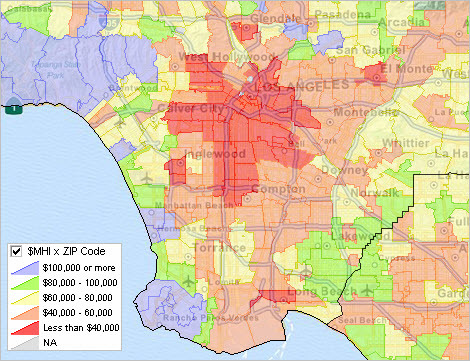 Census tracts are more suitable for demographic analysis as compared to ZIP code areas. Yet, users of these data seek to understand patterns by ZIP code areas. This section reviews how that can be done. The applications make use of census tract demographics based on the ACS 2013 5-year estimates. Geographic Information System (GIS) resources are used here. The census tract to ZIP code area relationship can also be be shown in an equivalence table. See the census tract to ZIP Code area interactive equivalence table. While the equivalence table is very useful, use of GIS tools offer a much more powerful method of understanding demographic-economic relationships. These applications are focused on the Chicago area, but the same set of resources can be used anywhere in the U.S. The graphic presented below shows patterns of the economic prosperity (median household income/MHI) by census tract in the Chicago area. MHI intervals and corresponding colors are shown in the legend at the left of the map. It is easy to see where concentrations of high and low MHI exist by census tract. Click graphic for larger view; view developed with CV XE GIS. Map view developed using TractZIP GIS Project. The graphic presented below shows a view similar to the map shown above. In this view ZIP code areas have been added. ZIP code areas are shown by black boundaries and labeled with the ZIP Code. As above, it is easy to see where concentrations of high and low MHI exist by census tract are located and now — how the distribution relates to ZIP code areas. Click graphic for larger view that shows ZIP codes as labels. The graphic presented below shows a zoom-in view in the vicinity of the pointer in the map shown above. ZIP code areas have a bolder black boundary and ZIP codes are shown as labels. K-12 school locations have been added, illustrating how yet other area characteristics can be integrated. The tracts thematic pattern layer is shown with see-through transparency enabling a background view of highways and related earth surface geography. The graphic presented below shows a zoom-in view of ZIP code view similar to the map shown above. In this view the focus is placed on ZIP code area 60622 — it could be any ZIP code. This view shows the ZIP code with white label and census tracts with yellow labels. It is easy to see which census tracts intersect with ZIP code 60622, which tracts are wholly versus partly included in the ZIP code area and the MHI for each tract intersecting ZIP code 60622. Install the GIS software and project used to develop map views presented above for areas of interest. Add other types of geography such as geocoded address data. Select alternative demographic-economic measures. Create custom map graphics. See the main Web section for details.